Does Your Child Have the Summer Camp Blues? Try Coding! You don’t want your children to miss out on the experience of summer camp, but it seems that the camp you sent them to last year just doesn’t fit them. You struggle with whether you should even send them anywhere this summer – then, you discovered Hatch. Hatch is a summer camp devoted to teaching kids coding (also known as computer programming). If you’re not familiar, coding is what makes it possible to create computer software, apps and websites. Basically, everything we do on our computers, phones or tablets is made with code. Pretty neat stuff, and definitely something you could see your technologically-driven kids embracing. You're a bit concerned about the social aspect – how can you make life-long summer camp friends while sitting at a computer all day? Well, computer programming is social-emotional. The kids can work on their own, but it is also a collaborative effort; they’re constantly working with others to discuss challenges and ideas, while at the same time developing the self-motivation to complete a project on their own. In addition to which, we do our best to set up industry visits for all our campers so that they can see how the skills they're learning right now will translate into a successful future. And - computer programming is inherently creative. Hatch is a different kind of summer camp with something for everyone. The beauty of this camp is that everyone can fit in and find something they love. So, while your kids still get a good dose of the outdoors during the summer time, at coding camp they will be able to learn some valuable skills and make great friends along the way. Goodbye camp blues! No matter what activities your child is interested in, there are excellent programs available to them. 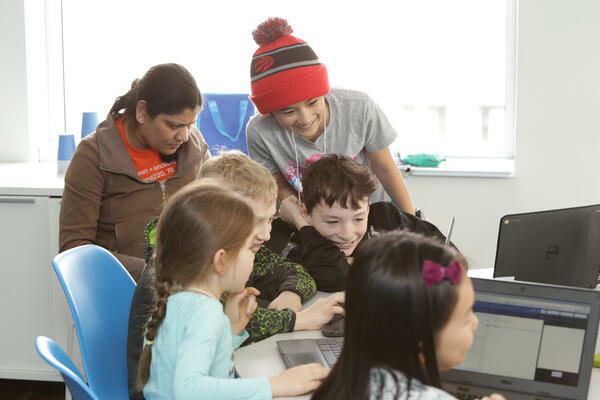 At Hatch, your children will learn coding and gain confidence in learning to problem solve. Learn more about camps, weekly classes at our centres and at schools.